The CRISPR-Cas9 gene editing tool offers tremendous potential for treating diseases caused by genetic mutations. The system uses a short sequence of RNA, called guide RNA (gRNA), to identify a section of the genome where an edit needs to be performed. Then along comes the Cas9 enzyme and, guided by gRNA, makes the desired edit in the correct place. 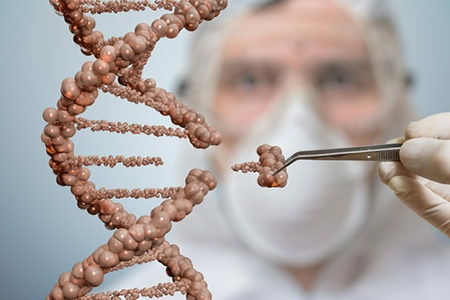 Unfortunately, while the gene editing system has great potential, there are only a limited number of places on the genome where edits can be performed. The problem is CRISPR needs a specific sequence of nucleotides in order to perform edits. The sequence is known as a protospacer adjacent motif (PAM) sequence. The Cas9 enzyme from Streptococcus pyogenes (SpCas9), the most commonly used Cas9 enzyme, has a PAM sequence of two G nucleotides. Without this PAM sequence, no editing will take place. Unfortunately, under 10% of the genome has such a sequence. If a mutation occurs in the other 90.1% of the genome, CRISPR-Cas9 cannot be used to correct mutations. SpCas9 is not the only CRISPR enzyme that can be used, but so far only a small number of suitable CRISPR enzymes have been identified that have minimal PAM requirements. The more specific the PAMs, the lower the number of loci that can be targeted. It is possible to engineer Cas9s to identify different PAMs, but the goal is to find one which can be used to make edits at a wide range of different loci. Scientists at the Massachusetts Institute of Technology have done just that. They have identified a new Cas9 enzyme in Streptococcus canis (ScCas9), which they claim can target sequences on around half of the human genome. The researchers developed computational algorithms that conducted a search of bacterial sequences to identify enzymes that were less restrictive than SpCas9. Many possible candidates were identified, but it was not clear which would be the best option. To test the different enzymes in the lab, the team built synthetic versions of the CRISPRs and evaluated their performance. ScCas9 proved to be the most successful. “The enzyme looks almost identical to the one that was originally discovered … but it is able to target DNA sequences that the commonly used enzyme cannot,” said study co-lead author Pranam Chatterjee. Instead of being limited by DNS sequences with two G nucleotides, the new enzyme only requires a single G nucleotide. Most genes are around 1,000 bases in length, so if scientists need to simply knock out a gene, this is relatively straightforward. It is possible to target various loci on the gene. However, many genetic diseases, including sickle cell anemia, are caused by a mutation of a single base. That means in order to make an edit, CRISPR must be able to bind to a very specific location, which is beyond the capability of SpCas9. ScCas9 therefore opens up many new possibilities. Even so, the researchers are continuing their search for Cas9s that can be used to target even more of the genome. “We feel confident of being able to go after every address on the genome,” said Joseph Jacobson, lead researcher of the study at MIT Media Lab.